Vacation Homeowners – List your vacation Home Free on 250 Sites and no other payments.Deposit Direct to your Bank before you rent with no percentage taken out and talk to homeowners before you rent. We do not promote Hotels and Motels we promote the small businessman trying to rent his own vacation home. All you have to do is sign up for free to take credit cards and we will do the rest. Use this link here to get started. We are not part of the Homeaway and VRBO group we are better to call (678) 271-8886 after you join so we can help with your listings. Vacation Rentals Rent My Vacation Home – Homeowners do you want vacation rentals and want to be contacted directly with no money taken out – This is the answer you found it. We list you on 250 sites. Do you want vacation rentals and you’re tired of the middleman? Why would you rent to people you can’t talk to in advance.? If the answer is I would like paid in advance and talk to who would rent my house with direct deposits to my account then this site is for you. 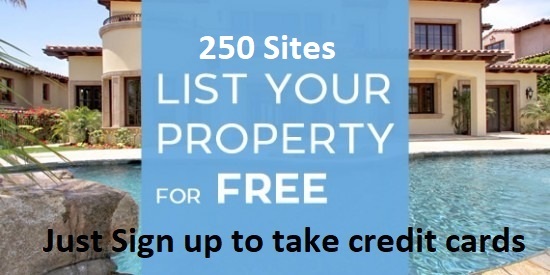 Join today – Free Web Site Build and we work with all major vacation rental sites. The vacationer contacts the homeowner directly no middleman or % taken from sale. Just join and email us we do the rest no wait !!!. List My Vacation Home For Rent and Accept Credit Cards Deposits direct to your bank before you rent not after. We list you on 250 sites.